Concentration camp US intelligence history: Office of Strategic Services map. 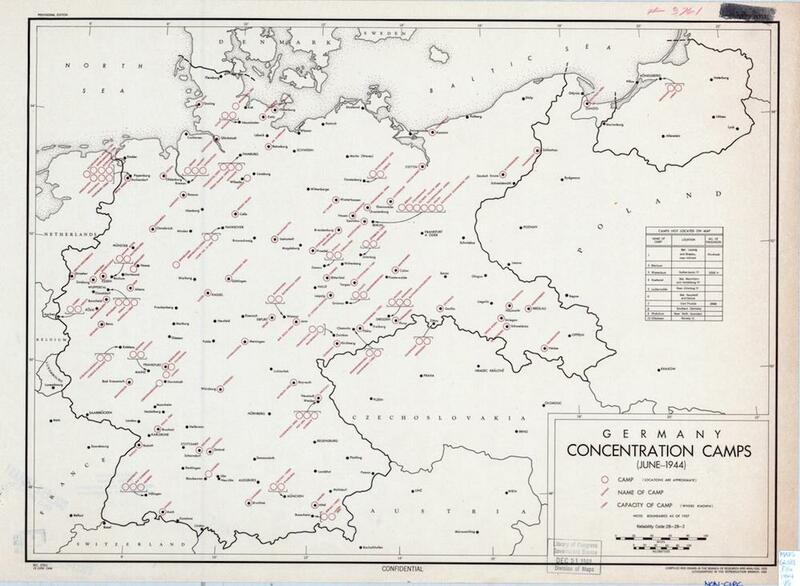 This map represents the knowledge that the Research and Analysis Branch of the United States Office of Strategic Services had about German concentration camps in the early summer of 1944. Red circles denote locations of camps, and the prisoner capacity of the camp (“where known”) follows each camp’s name in parentheses. The Office of Strategic Services, formed in 1942, was the Roosevelt administration’s attempt to coordinate intelligence-gathering within a single agency during World War II. The OSS’ Research and Analysis (R&A) Branch published a series of European maps during the war, cataloging countries’ strategically relevant attributes (railroads, sewage, canals, industry, weather). The Penn State University’s Donald W. Hamer Maps Library, which digitized this map, has a Flickr set of other OSS maps, which you can browse here. This map shows the information that the R&A branch of OSS had about concentration camps within Germany, a year before those camps were liberated. It seems likely that this map would have been drawn up using a “List of German Concentration Camps” compiled by British intelligence and shared with OSS in June, 1944. Even in the summer of 1944 as we received with horror the mounting flow of information about the camps, most of us were still thinking of an increase of persecution rather than a new and barbaric policy of genocide. Breitman reports that the OSS followed the general American policy of seeking out information that would gain the United States a strategic advantage in the war, rather than investigating reports of genocide. While documentation that pointed to the Holocaust might have reached some OSS operatives who had higher clearance than those working in R&A, the agency’s policy was to downplay this aspect of the Nazi regime, preferring instead to focus on intelligence that the government perceived as directly actionable. Click on the image below to enlarge, or visit the map’s page on the Penn State Digital Collections website. Donald W. Hamer Maps Library, Penn State University.